This week I write about 2nd Great Grandmother Elnora Busby Vincent, who’s child, Susan R. Vincent/Vinson married Peter Fletcher Howell. Elnora Busby (aka Ellenior Busbee) has a confusing birthdate. It is possible she was born about 1818 in Halifax County, North Carolina; however, it is more likely she was born in 1825 or 1826 in Nansemond, Virginia. United States),. The census records are conflicting. The 1850 Census indicates her name as Lenora, age 32 born in Virginia, but the 1860 and 1870 Censuses suggest she was born in 1825 or 1826. Her parents are unknown. Some records indicate the Busby surname may have been spelled Busbee sometimes. 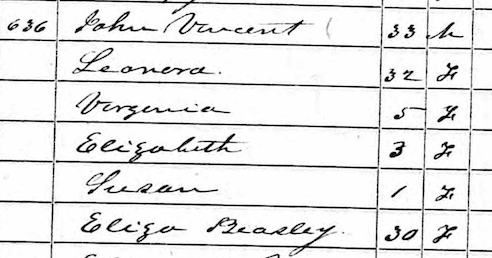 In the 1850 Census, “Lenora” is 32 and living with her husband and first three children. 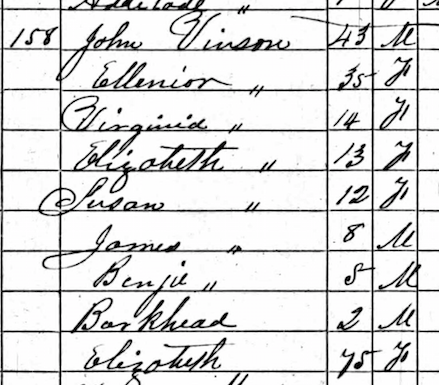 In the 1860 Census, “Ellenior” is 35. The change in name from Lenora and the 7 year change in age makes me think that Lenora and Ellenior might be two different people and that John married again between 1850 and 1860. I have found records for two children which indicate that Elnora is their mother. I have not, however, found birth records for any of the children born before the 1850 Census, so I’m not convinced that Lenora and Elnora are two separate individuals, yet, but I expect that to be the case. Marriage : She, presumably, married John Vincent, the son of Burkett and Elizabeth Vincent sometime before the birth of their first child Virginia in 1844. The Vincent surname is somewhat problematic as it appears to have been interchanged often with Vinson in several records. As such, I consider Vinson to be a variation of Vincent. Child #1: Virginia was born between 2 Jun 1844 and on 1st Jun 1845 in Halifax County, North Carolina. She died on 20 May 1923 in Faucett, Halifax County at age 77, at least. She has no known descendants. Child #2: Elizabeth Vincent was born between on 2 Jun 1846 and on 1st Jun 1847 in Halifax, North Carolina, United States). She had no known descendants. Child #3: Susan R Vincent was born about 1847 in Halifax County, North Carolina. She died on 1st Mar 1910 in North Carolina, aged about 63. She married Peter Fletcher Howell on 10 December 1866. She had 7 children: Anna, John, Augusta, Martha, James, David and G.
Child #4: James W Vincent was born between 2 Jun 1851 and on 1 Jun 1852 in Halifax County, North Carolina. He has no known descendants. Child #5: Benjamin J Vincent was born about 1855 in Halifax County, North Carolina. He died on 3 July 1931 in Roanoke Rapids (Halifax, North Carolina, United States), aged about 76. He married Bettie [Unknown], next he married Sally. He had one known child: Georgin[?]. Child #6: Joseph Burkett Vincent was born between on 2 Jun 1857 and on 1st Jun 1858 in Halifax County, North Carolina. He died on 31 Aug 1917 in Roanoke Rapids, Halifax County, North Carolina aged 59, at least. He had no known descendants. Child #7: Ellen B Vincent was born between 2 Jun 1860 and 1 Jun 1861 in Halifax County, North Carolina. She married Wanick S Hockaday. She had 2 children: Nathe and Alice. Child #8: There may be an eighth child born to John and Elnor, Jennie. There are no other references to Elnora in later census records, so it is presumed she died before 1900; (There was no 1890 Census Record.) however, I have been unable to find a definitive death record. Note: Benjaman Vincent’s Death Certificate indicated mother as Elnora Busby. In the 1850 Census an Eliza Beasley, age 30 is also living with bly a sister. In the 1860 Census Ellenior is 35. The change in name from Lenora and the 7 year change in age make me think that Lenora and Ellenior are two different people and that John married a again between 1850 and 1860. Note: John Vincent – Age 33 – Farmer – Property value $50 – Born Halifax County. Lenora – 32 – Born Halifax County Virginia – 5 – Born Halifax County Elizabeth – 3 – Born Halifax County Susan – 1 – Born Halifax County Eliza Beasley – 30 – Born Halifax County – Could not read &amp; write. — Family 637 — Elizabeth Vincent – Age 64 – Born Halifax County Nancy – Age 25 – Born Halifax County – Could not read &amp; write. Note: Farmer – Real Estate Value: $800 – Personal Estate Value $538 – Cannot Read & Write. Note: Farmer, Property value: $1,800, Personal Property value: $600, Born in Virginia.